Fold and create with authentic Yuzen paper. This origami pack contains four 6-inch sheets of hand silkscreened Japanese Chiyogami Paper in the Masquerade pattern. 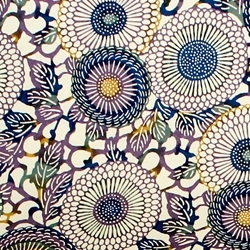 This Japanese Chiyogami Paper soothes you with purple and blue flower blooms floating against a light creme background. This traditional style of Yuzen Paper is hand silkscreened onto a high content Kozo base providing durability and flexibility. Yuzen paper is the standard in traditional Japanese origami folding because of its strength and ease in folding. The colors are applied with pigmented ink which resists fading making this an ideal paper for origami sculptures you want to display. This paper has a weight of 70 gsm and is acidic.